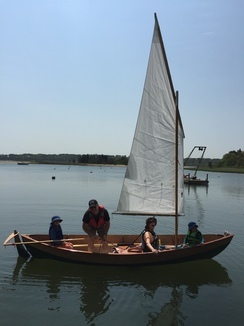 Sunday of Memorial Day Weekend was the big day for Zeppelin, the Skerry! And for Norm and Elizabeth too! Hard to believe that Zeppelin could make the transition from project to sailboat! 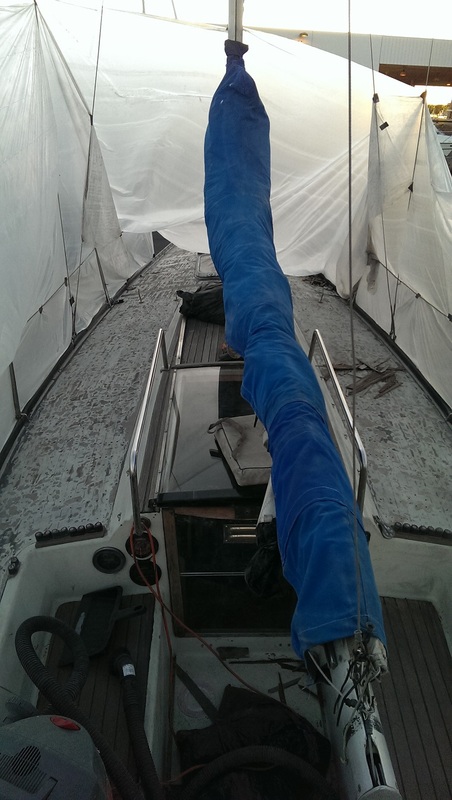 Nightmares of the strakes exploding, the boat turtling, the copper wire holes springing leaks; did not dissuade us from driving her to Round Cove and launching her at the boat ramp there. Good friend Tom, who was visiting, took pictures and swooned along with us as we admired our handiwork. Floating upright! Still dry in side! 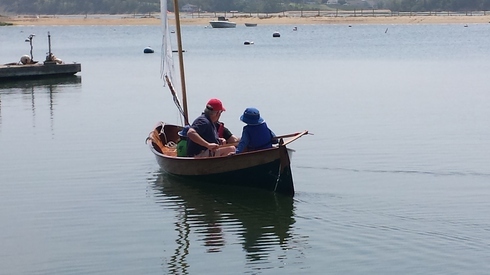 I took her for a row around the mooring field, while we waited for the grandkids and family to arrive. She rows really beautifully, slips through the water with nary a ripple. Not so easy to turn her. She definitely wants to go straight and keep on going. 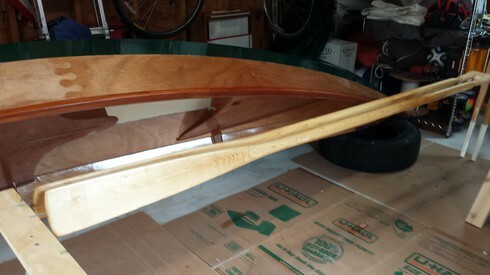 My rowing is still amateur level, so this will be something I can improve. 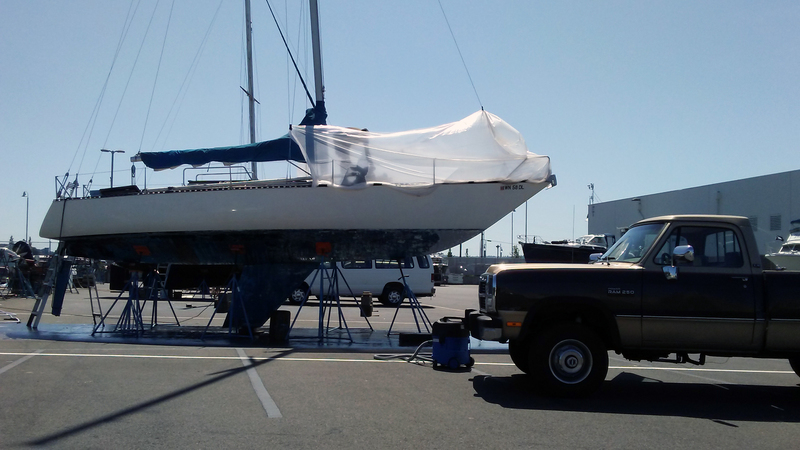 Back at the dock, we rigged her for sail. 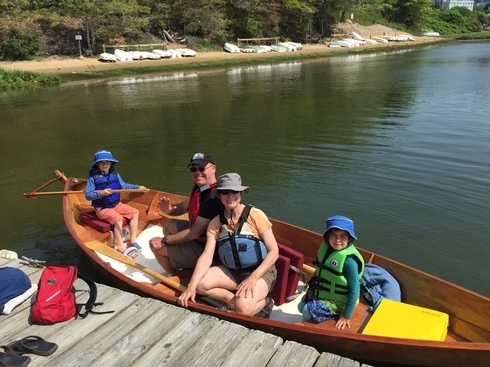 The grandkids couldn't wait to get on board. Z took command of the tiller. Headed out to more wind, and took a turn around the mooring field. Everyone got a turn in the boat. 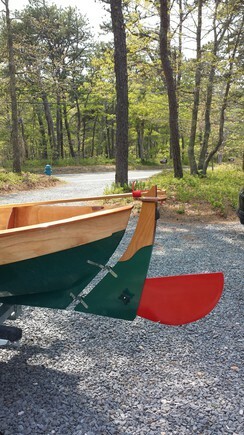 Tom went out last, and he and Norm noodled out a better tiller extension/tiller connection. Still a work in progress. Now it is a piece of 5/8" line through both holes, with stopper knots on either side. After all this practice sailing, it was time for a beach plan. Norm and Elizabeth took the two kids in the boat out the channel, across the bay, and anchored her off Jacknife Beach. 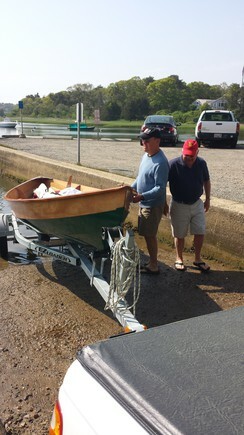 Tom headed back to Kittery. The parents went to get lunch for everone at the Corner Store. Zach and Tab went home to get beach chairs and umbrella. We all met up on Jacknife Beach and had a lovely afternoon. 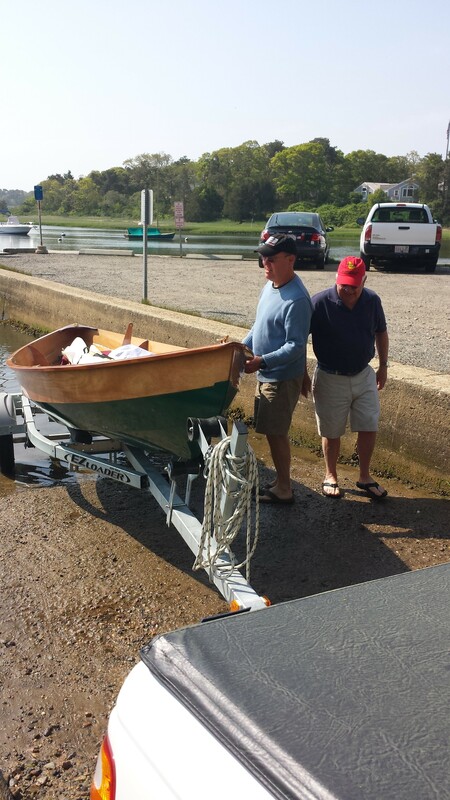 Around 2, Norm and E sailed the boat back to Round Cove, and trailered her home. We had to begin the prep for a big family dinner at Grandma-Norm's. Norm went racing at Cedar Point on Wednesday. Left home alone with the skerry, I puttered and fussed. 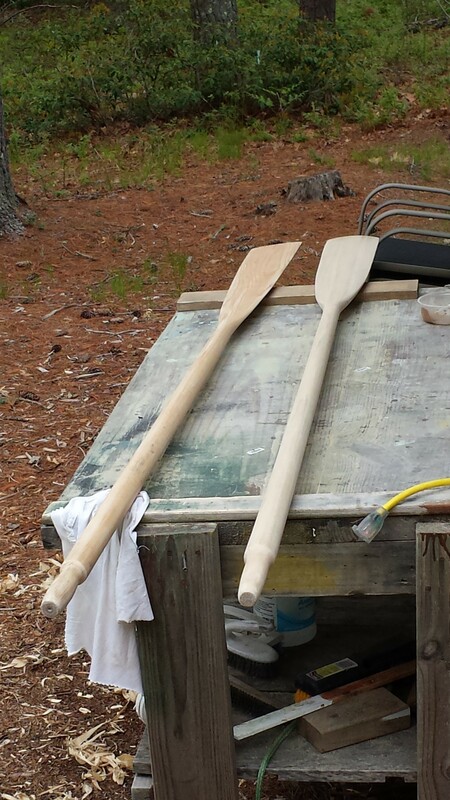 Finished the varnish on both sets of oars. Wrapped one pair. Touched up varnish on the underside of the rail. 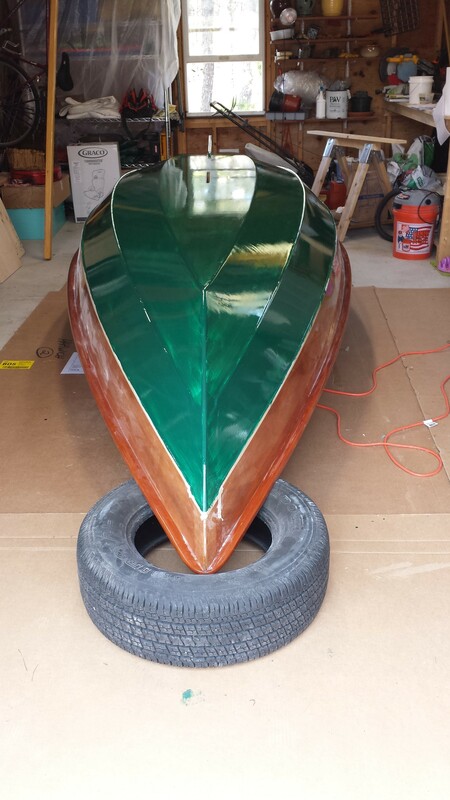 Removed the fine line tape, and touched up the green edge between the second and third strake. Etc. Etc. When Norm got back on Thursday afternoon, we put on all the hardware. The gudgeons and pintles; the oarlocks, the bow cleat, the binnacle ring on the stern, the tie down fasteners for the trailer, on the stern. And on and on. It was a lovely afternoon, putting the final pieces together. 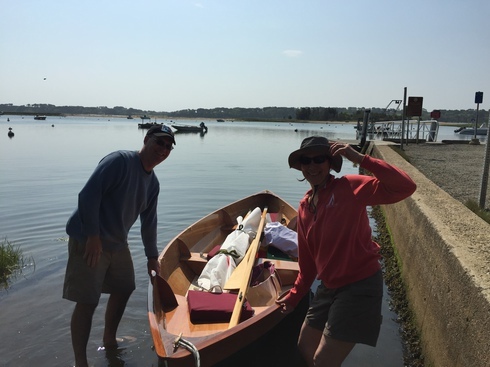 We put the anchor together, measured halyard and downhaul, noodled out the tiller extension-tiller bungie thingy. We wanted to be ready to roll for this weekend, when we will see the Cambridge grandkids! Work work work. We dream about our project list, we meet over breakfast and discuss our project list, we jump into our tyvek and attack our project list! So close! Parrel beads today. I have beads for macrame. Same thing? Apparently. 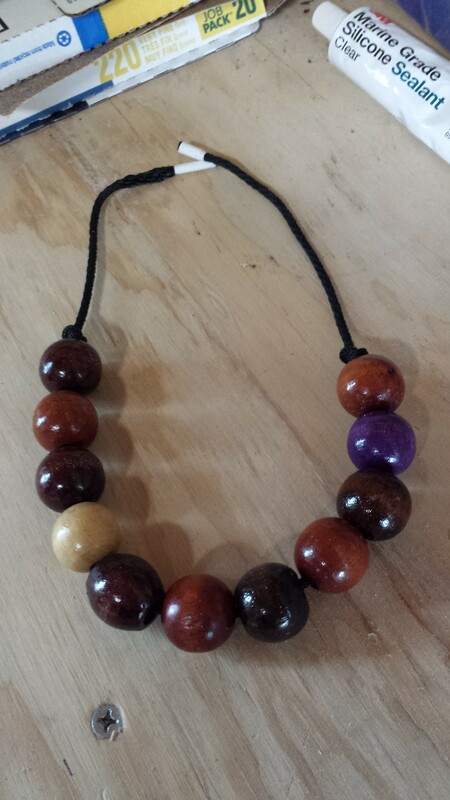 So a Parrel is just a necklace for the mast, using beads to reduce friction. What friction? 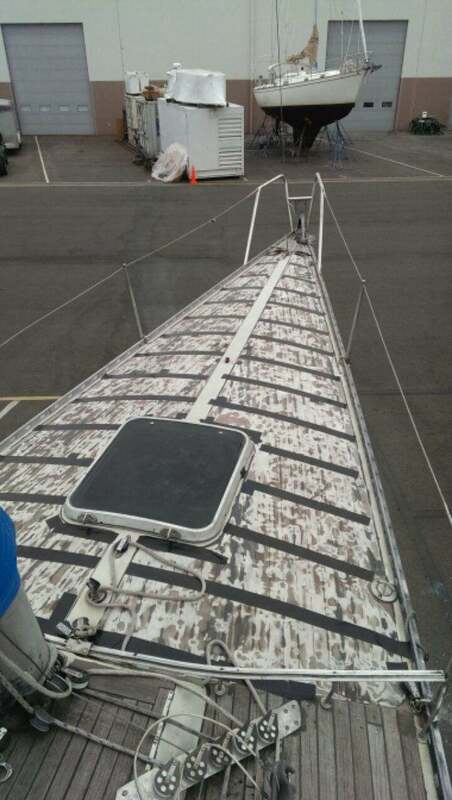 Well the boom isn't fixed to the mast, so on a lug rig, a Parrel is the device used to connect the two. This wraps around the mast, and hooks onto the boom, currently through the hole made for the downhaul. Keeps the two spars joined during operations like raising the sail and reefing. 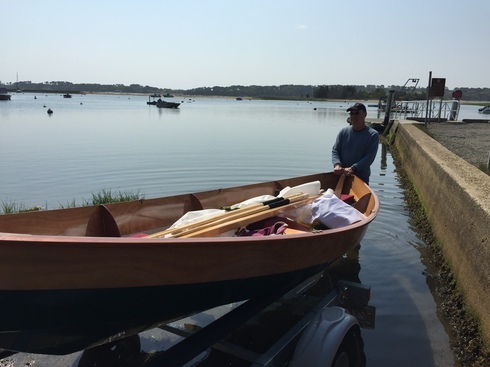 Get out the planers and try to reduce the weight of the second oar, and bring it closer to the foil shape of the first oar. 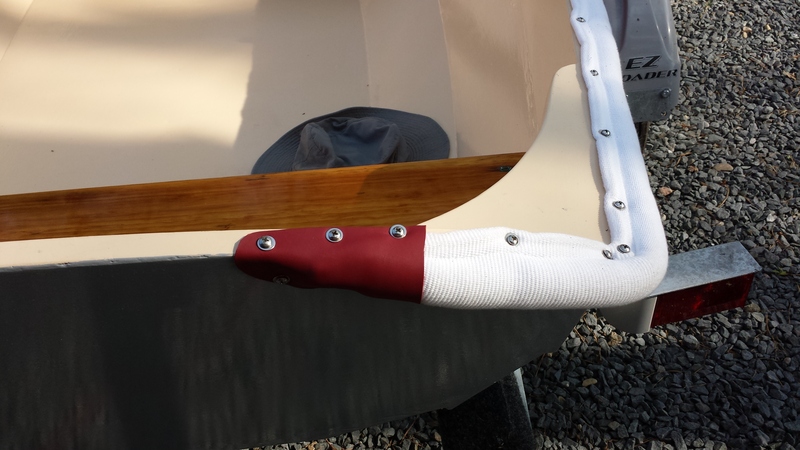 We also needed to reduce shaft of the second, to keep it balanced as the weight of the paddle was reduced. 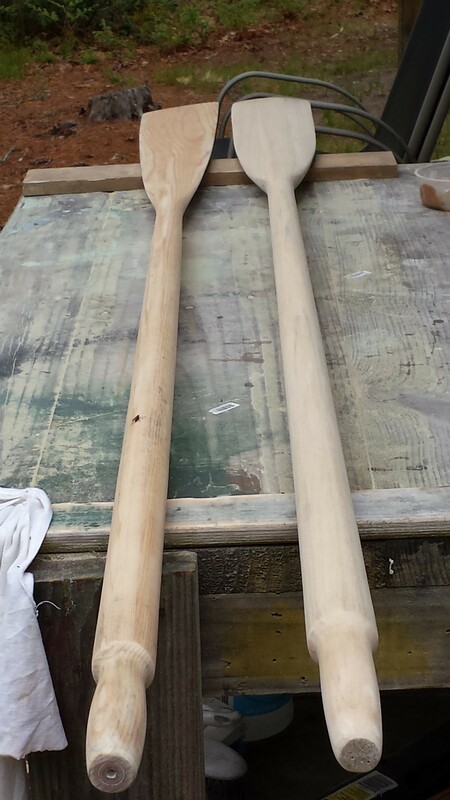 Putting the two oars side by side on the workbench on their balance point kept us honest. After planing the bulky oar, I went at it with my favorite tool, the orbital sander, starting with #80 grit and working up to 220. 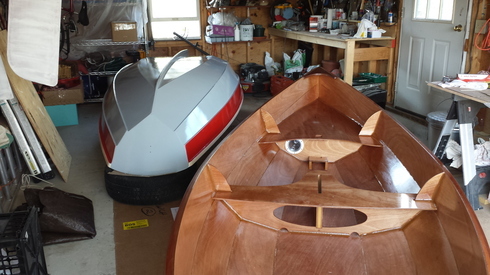 A little epoxy work to fill splits and gouges, and they were both ready to varnish. An interesting thing to note. 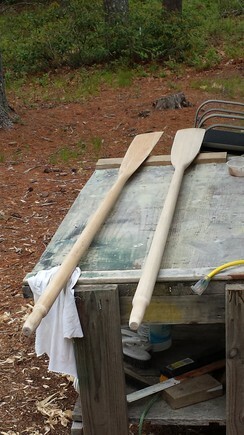 Oar #2 on the right was made of a center 2x4 with extra pieces laminated to the sides to create the width of the blade. Oar #1 was made from a 1x6 with additional wood scarfed to the handle to round if out to the 2 in diameter. Two approaches, two very different oars. Now close to each other in weight and balance. We shall see how they row! 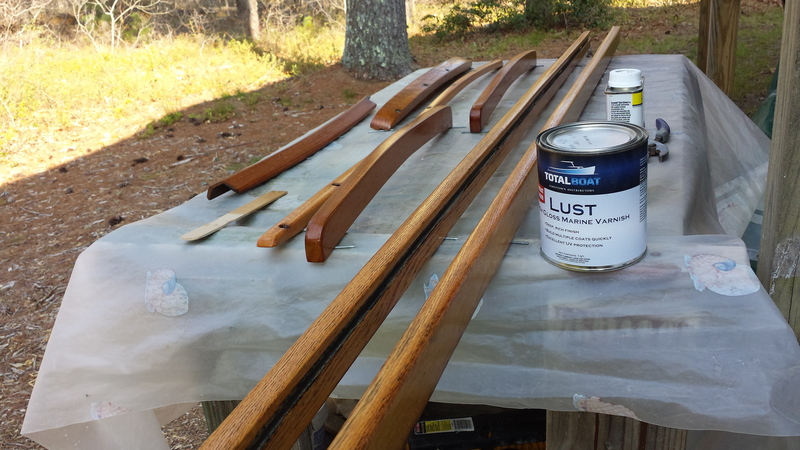 Another look at the skerry behind varnished oars drying. We got the last coat of interior paint done after adding the non-skid. Only a few more things to do! Like buy purple mainsheet! And a yellow throwable PFD. The list of things to do is getting short: the rudder is fitted and ready to be installed, the rig is fitted and ready to go sailing after we install the yard and boom parrels, There are a couple more coats of paint planned, the trailer fits, and the kids are coming for a first launching in a week. We set up the old boat shop as Elizabeth's sewing room so sail bags and gear bags can be made. After Marina gets some birthday treats from Grandma. 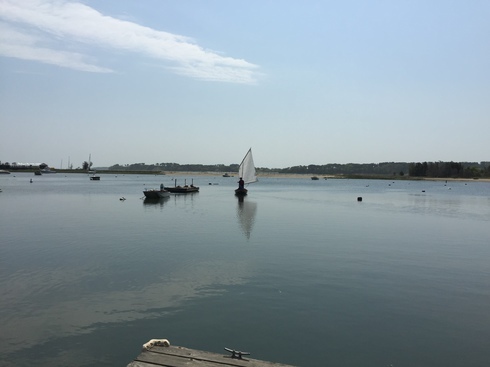 After breakfasting at Chatham Light, watching kite surfers playing with the northeasterly wind, we drove across the Muddy River Bridge for the first time since January I guess. 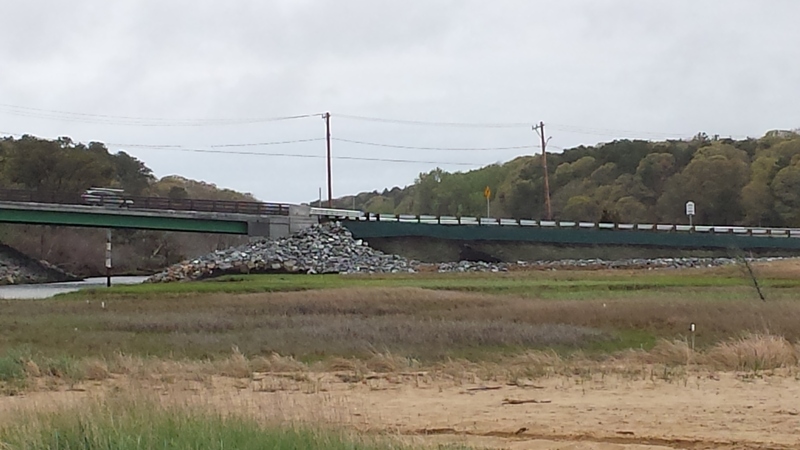 The bridge is open!! Brand new Muddy River Bridge, Massachusetts State Road 28, at the Chatham/Harwich border. Today, May 22nd, is perfect: rainy. No sanding or painting! 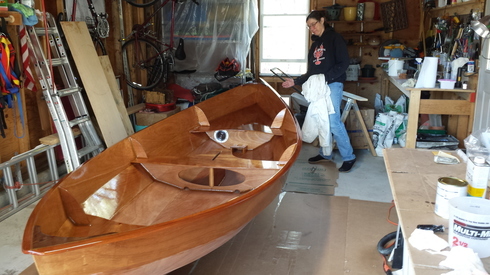 That said, we've been busy with the boat. 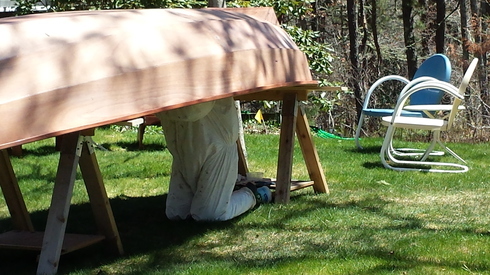 Yesterday, we hung the rudder but took no pictures. 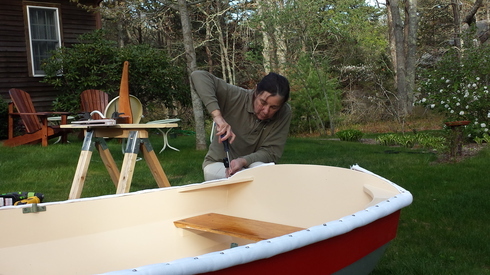 Picture of the rudder before drilling holes for the pintles. The rudder assembly is complicated mostly by the fact it has to move and while screwing it to the boat it must stay still. We rigged up some amusing contraptions we loosely referred to as shoring or blocking. 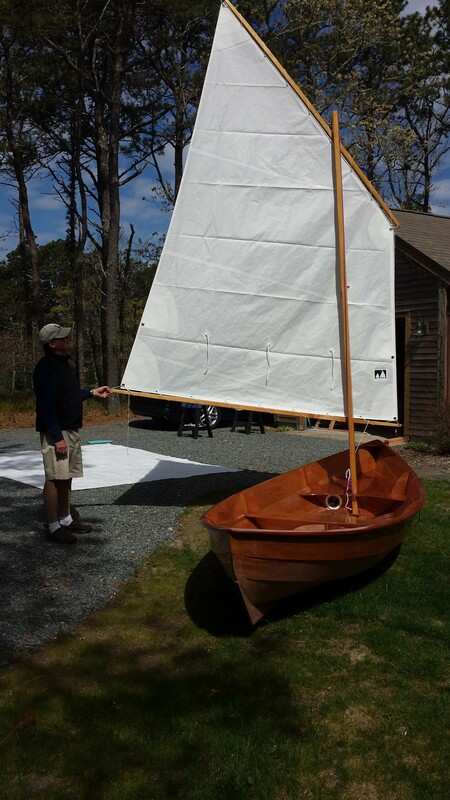 Having the trailer was a big help as Zeppelin the Skerry is at a good height. Leading up to yesterday: Fitted foot braces for rowing. Fitted boat to trailer. (RMV trip required and as usual, very nice wait...). Stepped mast and hoisted sail, tested reefing. Primed surfaces to be painted. Painted surfaces to be painted. Got first coat of varnish on new oars. 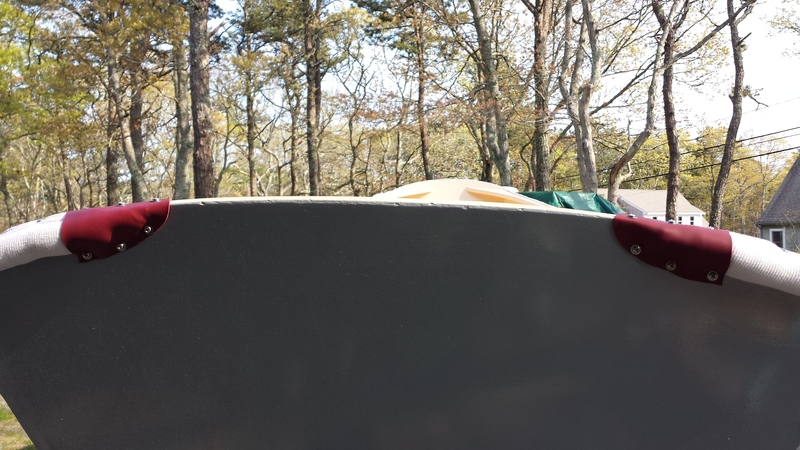 The exterior paint on the hull looks nice. It is Interlux Sea Green The interior has two coats of Interlux Hatteras Off White. We have tipped the spars with the off-white, too. We got a little love in for the Nutshell too. The latigo leather arrived, and E made the gunnel guard end caps. Pretty spiffy! Sand and varnish... sand and varnish. The final coat of varnish. A lot of work leading to a beautiful result. Next on the job list is to paint the inside bottom and first streak in off white. Then we will flip the boat and paint the exterior dark green. Having some fun with the foils in red. Sand and Varnish. The other day we made a joke about how many coats of varnish we would apply. "How about a dozen," I quipped. Something suggesting, "No," was the reply. A few minutes later son Zachary drove up and said, "Looks nice, are you going to put on a dozen coats?" 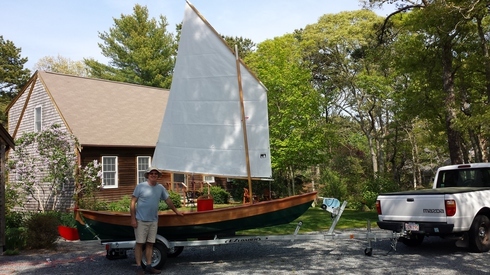 Zachary is a boat yard guy and knows about sand and varnish. Three coats will be perfect, we all agreed. Two are on. We did learn that our little foam roller covers followed by a gentle tipping with a foam brush is the way to do the job. It is faster, has fewer holidays, and the roller is easier to use. Then we hopped onto the nutshell pram rub rail project. It looks beautiful. 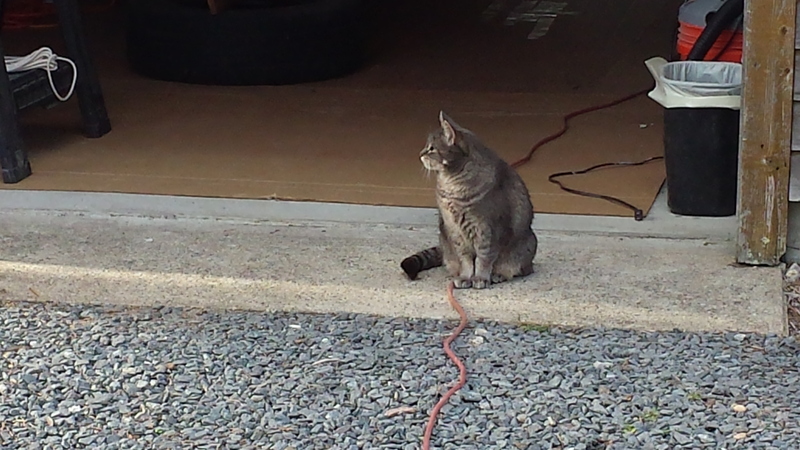 The boat shop cat is nonplussed. Friends Jarred and Megan are sharing some pictures and stories of their new-to-them Aphrodite 101, Elixir. We have not met them but have communicated in a very close way and we thank them for it. Jarred's Dodge 250 trumps my Ford Ranger badged as a Mazda 2300. No matter, trucks are fun. Out here on Cape Cod, I am always pleased to see the other truck guys give Elizabeth a little respect when she drives our pickup. Our truck is the most useful tool in the shop. So. Whats to removing a teak deck? A lot of work? Teak is beautiful until it is ugly and then, it is Ugly. Good job kids! Deck ready for refinishing with....? Check back later. Aphrodite's such as Averisera don't have much teak work on deck so I don't mind lavishing a bit of love on mine. 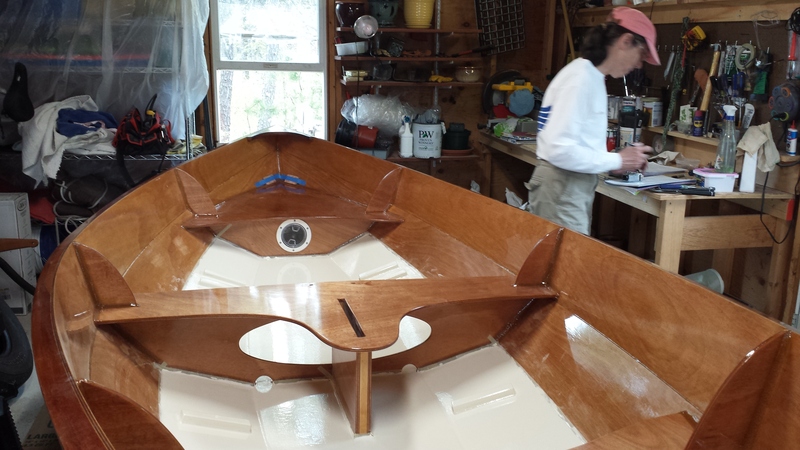 We are trying out a varnish from Jamestown Distributors in Rhode Island. 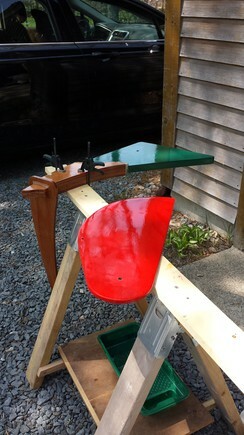 I can recoat every hour or so up to four coats... without sanding. We will let you know. 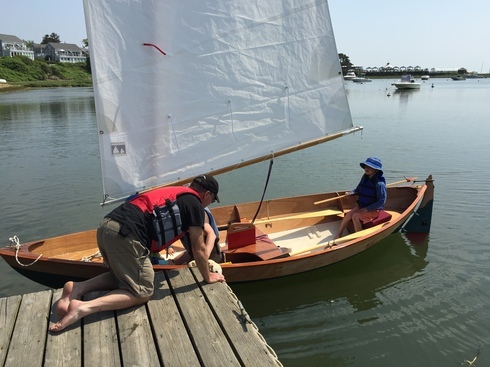 Someday we'll actually go sailing! Sand and varnish. Sand and varnish. We are closing in on the end, we can taste it. Some days we move the Skerry outdoors. It isn't raining so outside with you Skerry." Mama had a hankering to lay on another coat of grey to the Nutshell Pram so we did. A little while later, we lifted the Skerry into the garage. We have a two boat garage. Some varnish work was accomplished on the Aphrodite parts. Seen here are the components. We are using Jamestown Distributors Lust Varnish, which is pleasing Norm. Lust varnish dries quickly for easy recoating. Recently, we heard from a couple in Seattle who just purchased Aphrodite 101 US 29. It is always good to hear from another Aphrodite owner. We got a picture and permission to show it. The delivery home by the new owners. Norm and Elizabeth had a rougher ride with Averisera in April of 2007. Aphrodite 101s deliver great rides in the best or worst conditions. Welcome. Friday before Mother's Day and orbital-sander-girl is at it with vigor. Beautiful day, almost warm and sunny. 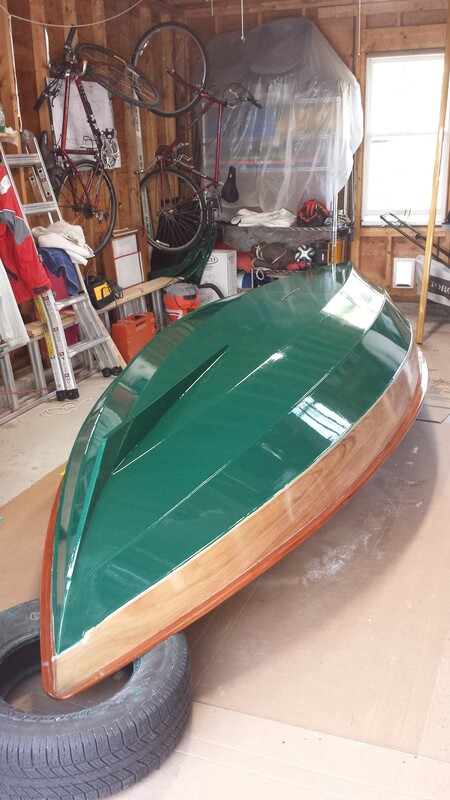 The final lap before we start painting and varnishing, touch up all the surfaces. E got right to the task with her favorite two tools, the DeWalt orbital and the Fein multi tool. The next day, as I (Norm) write, it is chilly and foggy so no painting. So... crazy rotation problems. Norm upgraded to Windows Ten and now nothing works as it used to. E can fix this... in time. The weather has been sub-optimal for epoxy work. It is wet and cold. 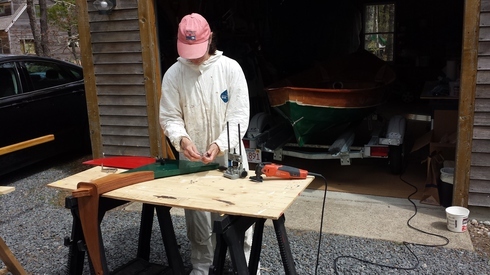 Elizabeth sanded some of the fillets and together we installed the mast step. Sure hope it is in the right spot! 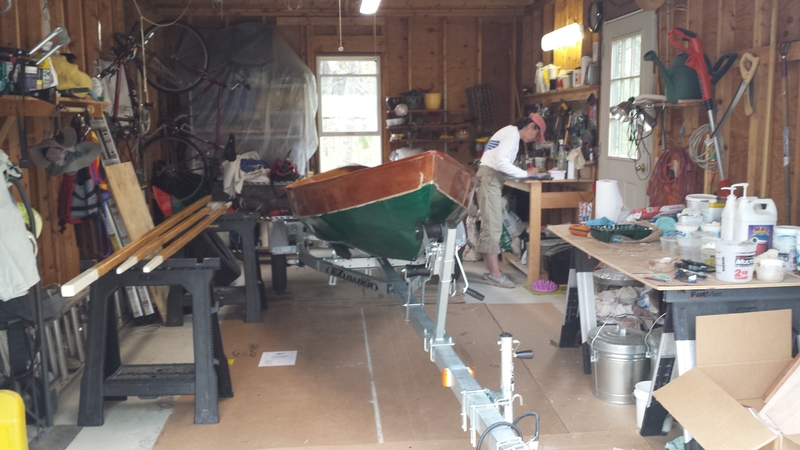 Next boat I/we build: Mark the centerline early. There is probably an instruction I ignored and now it is apparent that a line down the center on both sides of the bottom panel would have been a brilliant thing to do. In lieu of that, we measure, look, fiddle, and hope for the best. 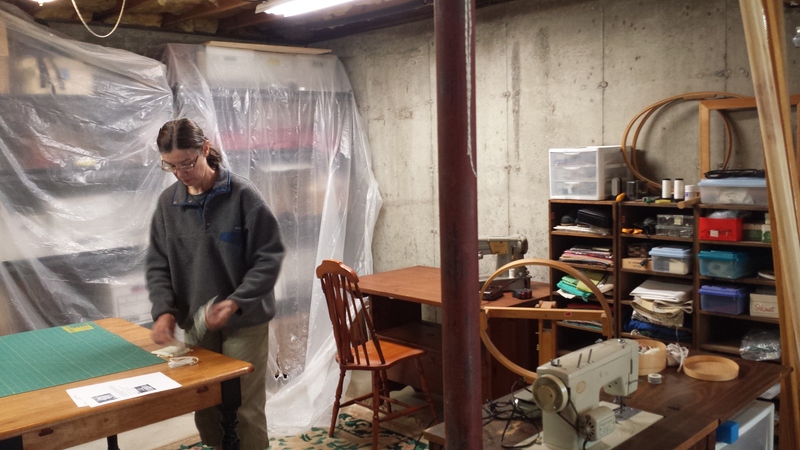 It is too wet to sand the spars outdoors and we don't want to do it in the basement. Spring in New England. 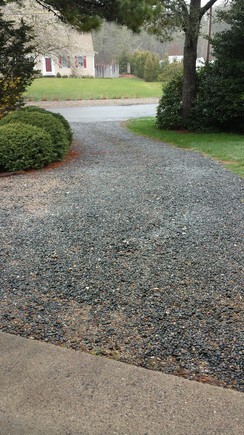 At the house we manage, Elizabeth's mom's, we got in 3.46 tons of 3/4 inch blue stone for the driveway. 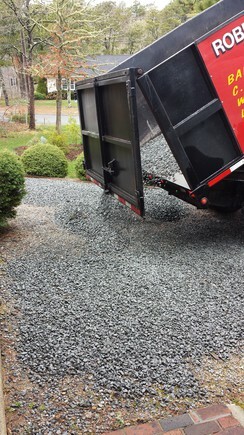 The guy driving the dump truck has genius level spreading skills. After he was finished laying down the layers, we took about a half hour to finish the job. Before, during and after. 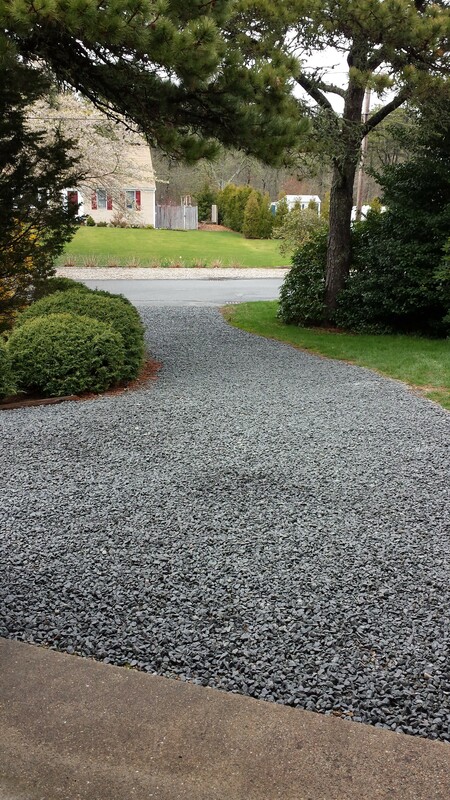 Nice work on a cold and rainy day. After a break because of cold weather, we are back at it. Glued the rudder together and have now finished the filleting. It looks very strong. The other day, it was a nice warm day. We moved the skerry from the garage to the front lawn where it warmed nicely. 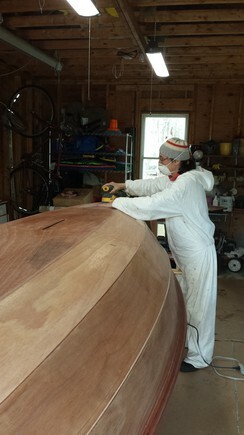 Elizabeth climbed underneath with her filleting slurry and filleted the undersides of the thwarts/seats. Norm cleaned the garage, fussed with touchups on the Nutshell, and got the spars ready for tapering the remaining spar. 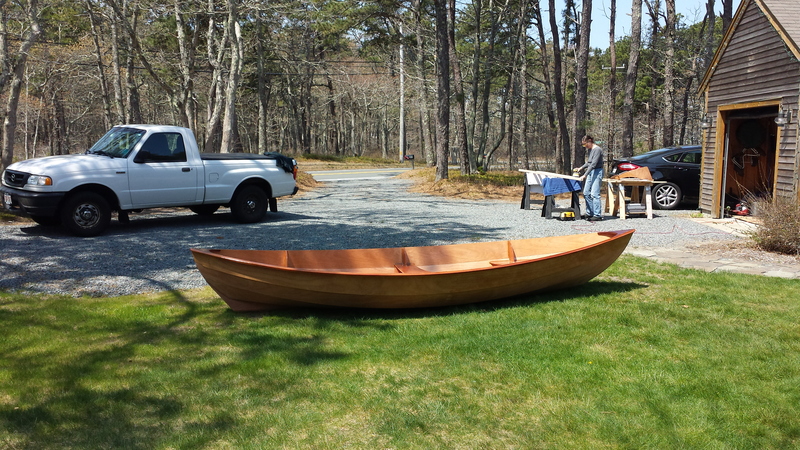 We are ready to sand the spars and varnish them shortly. 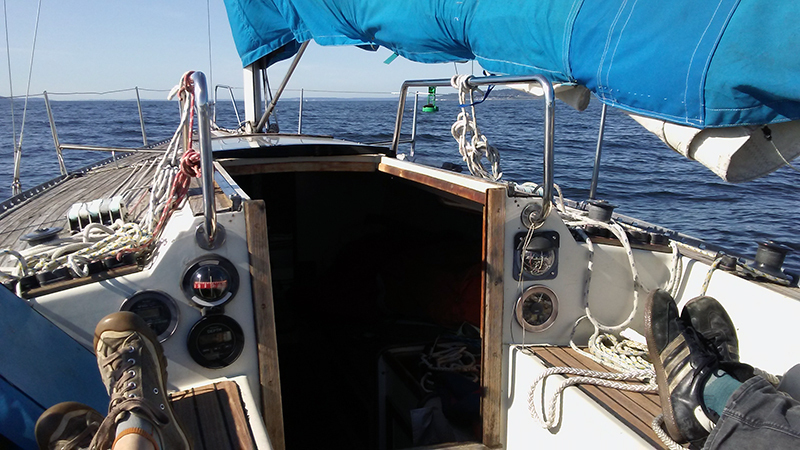 In other exciting news: the new owners of Aphrodite 101 US 29, Elixir of Seattle contacted us about their sailing and renovation plans. Back in aught six we first saw an Aphrodite 101, Kestrel, in Bellingham and fell in love with the type. 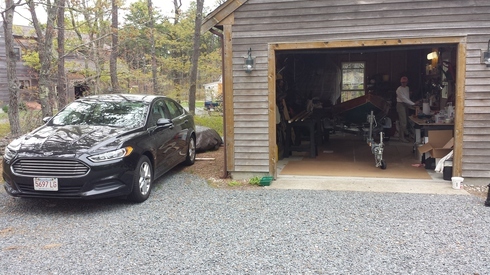 We came home to Boston, found one for sale in Connecticut and made her ours in aught seven. No regrets!